While eggnog is held in higher regard than say…fruitcake, it’s still not always respected. It’s old-school. It’s quaint. It’s the kind of party drink Clark Griswold enjoys. Then again, all things “old-school” seem to be enjoying new-found popularity. (Can you say “retro”?) Old-fashioned cocktails are making a comeback and I’m betting eggnog is poised to do the same. This train of thought led me to my most recent Blog of Funny Names post. Would you please hop over to read about funny eggnog names (bonus comic included)? Then return for a recipe and a snack! Researching the BoFN post made me thirsty for eggnog, though I wanted to try my hand at DIY instead of buying store-bought. An Alton Brown recipe (Anyone else an AB fan? I love this man.) came to mind, so I googled and hit the kitchen. Brown offers uncooked and cooked versions of this holiday punch. Knowing full well that consuming raw eggs is not recommend, I went with uncooked anyway, mainly to save time. (Pasteurized eggs are an option, though the whites won’t whip as fully.) 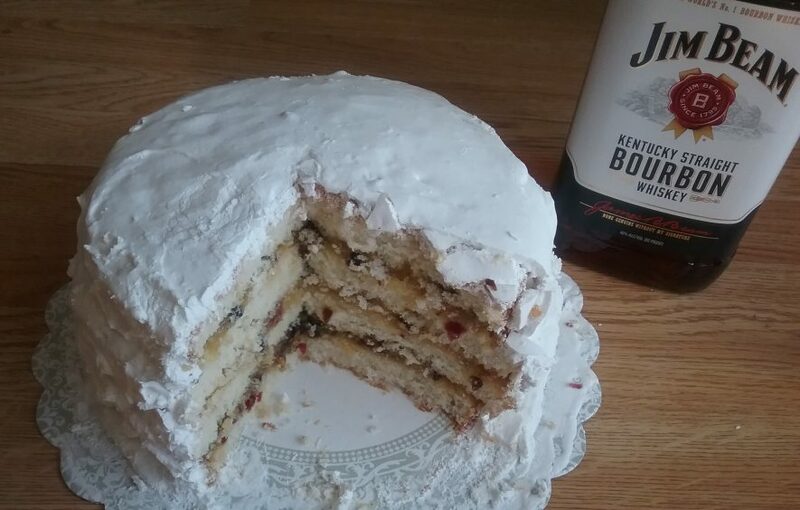 Without whole milk, I subbed in soymilk and also used rum instead of bourbon. As well, I cut the recipe down to make only one serving. The cooked version would have been thicker, I’d imagine, but still creamy and decadent in its own way. What matters most here is how unbelievably easy it is to whip up your own batch of eggnog. Even without the booze, this is a lovely holiday beverage: Think of it as (melted) ice cream for winter. With a mug of eggnog at the ready, we’ll need a snack. Preferably something healthy to balance out the cream and sugar. How about granola bars? 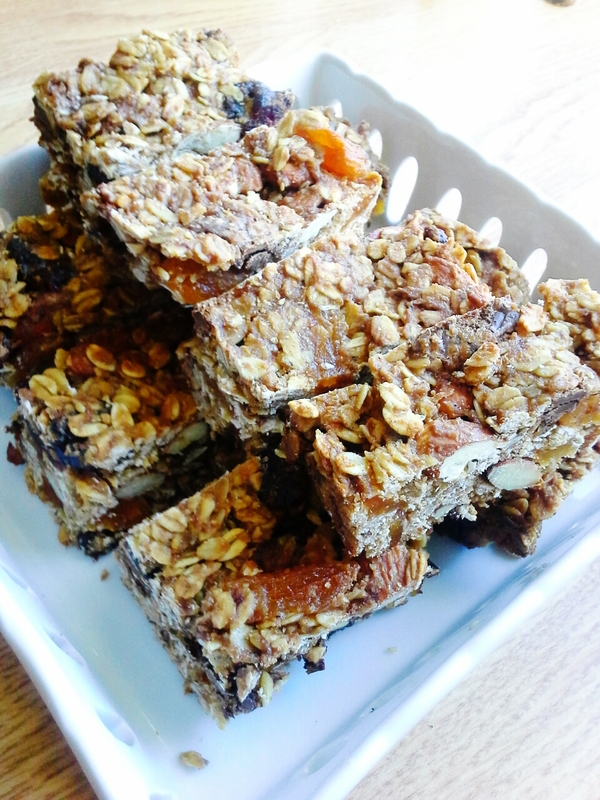 A few weeks back, food for fun offered a granola bar recipe. Soon after, Shanna of Curls and Carrots surprised me by sharing her AMAZING granola bars and crediting me with helping to inspire her recipe. These granola bars looked better than what I’d made and I looked forward to making a batch. No surprise–Shanna’s Favorite Granola Bars were phenomenal. With room for all sorts of improv, they can be made repeatedly without ever being the same: I used dried apricots in place of some of the dried cherries and almonds instead of pecans. I also chopped up chocolate bars instead of hunting down chocolate buttons. Shanna had also mentioned trying cinnamon along with the other spices, which sounds lovely to me. Now that we have our food and drink plated and ready to go, I offer you a warming winter beverage and a deliciously healthy snack. 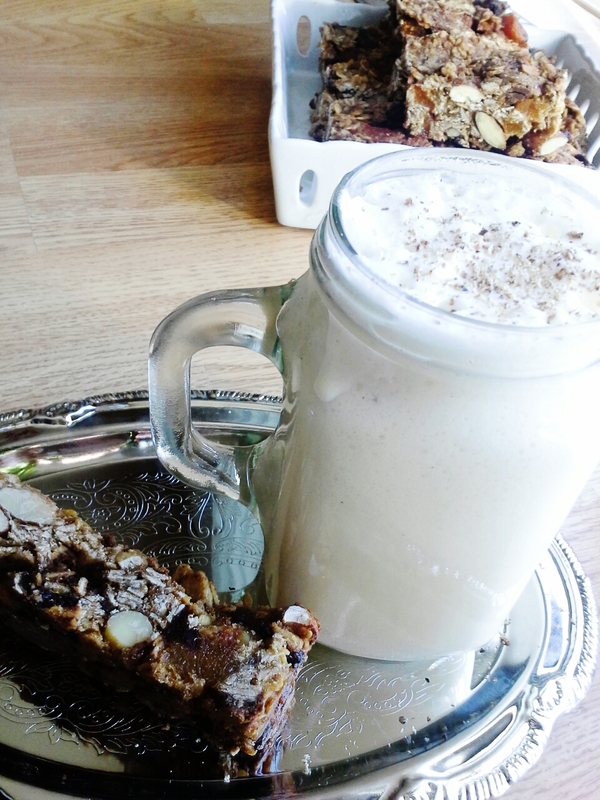 DIY granola bars and eggnog. Cheers! Eggnog on ice? Am with you on liking the beverages, Conrad, which is why I enjoy reading your posts. I’m glad you tried a homemade version! I an very bias when it cones to eggnog- probably because I was raised on the homemade and absolutely live it. I cannot drink store bought but I do live a little booze in it 🙂 cheers! got ya’ covered 🙂 Appreciate your comment, Lilly Sue–happy to see you here. Love that you enjoyed homemade growing up. I only knew the carton version, and while it was tasty enough, it wasn’t AMAZING like the DIY was. I’m a convert! Liz, if we ever meet, promise me this can be our afternoon snack!! I’m definitely going with the egg nog (soy milk too please) and would have a field day breaking up chocolate for the granola bars – with dried apricots (my fav)…Woohoo!! I am soooo butting in on this conversation and plans for a get together with Liz’s home made egg nog and granola bars!Yup, y’all can just scoot right over and make room for me on that couch!! Oh, I can supply the BEST ever dried apricots [family friends are IN the biz in my hometown!] So. Mimi chops choc and I bring the ‘cots (that’s what we call them at home, I even spent a summer cutting ‘cots!) and we all chat while Liz whips up our snacks. It’s all good. Right? 🙂 Cheers!! Thanks for butting in, Bonnie! And thanks for the couch–what a great idea. Thanks, Jenny. I was blown away by how “fluffy” the egg whites made it. Not sure that effect would carry through if the mixture was cooked, but it would be tasty just the same. Using such pure ingredients (eggs, milk, cream, sugar–basics all!) and so few of them–love the simplicity. Eggnog=festive, yes. Let me know if you give it a go 🙂 Would be fun (and fattening, lol) to do a side-by-side tasting with eggnogs made with rum, brandy, bourbon, etc. 😀 Hope a riot wouldn’t ensue. i will do my best to report back if we do go for the challenge and will wear my riot gear to prepare for the fray. awww, thanks, amb. Appreciate the good wishes–here and elsewhere. Am ready for the party when you are! I may be a little late to that party, because of course I’ve now fallen down the eggnog-rabbit hole and am finding all sorts of delicious things (creamy coffee eggnog! eggnog sugar cookies!!) YUM. But save me some eggnog and granola, please! I’m with you and Mimi and love dried apricots. Shutterbug does as well. A popular snack at my folk’s place growing up, thanks to the giant sized bags you can buy at Costco 🙂 A fantastic post as always, my friend. And! I love the festive snow on your blog!! Every year my mom would make about 10 batches of homemade eggnog for our Christmas open house. She would have a sip of each batch and if she didn’t get sick (which she never did) it was a go! Needless to say it was always the hit of the party, one neighbor would always run her finger around the punch bowl to get every last bit of the whipped cream that stuck!! I plan to make it this year for the first time with our boys, store bought does not even compare…though I do remember going through A LOT of store bought pumpkin eggnog last year when our 5 year old had his mouth rubber banded shut because he broke his jaw! And yes, we love Alton Brown too. We’re actually looking into going to his show that is touring now. Gretchen, you’ve given me chills with your eggnog story 🙂 What wonderfully fun memories. Love that your mom went overboard with the eggnog-making and hope my going overboard in the kitchen is remembered as fondly by my kids. You even remember how the neighbor loved it and licked up every last drop 😀 This is exactly why I love food and stories–they bring us back and connect us. I didn’t think store-bought eggnog was that great, but glad to hear others confirm that it’s inferior to homemade. You have another great memory for the pumpkin version now! AB is touring? Will have to check that out. Let me know if you end up going. I have a signed cookbook, but we dropped our cable so don’t watch his shows anymore. Love that he can laugh at himself. And so witty and dry. Intelligent humor. Thanks for coming by and sharing. Food certainly does bring people together and create many memories, both the success and failures. AB is indeed entertaining. When they did the Thanksgiving Live program I found out his mac and cheese recipe is the most searched item on food tv.com. That was the recipe I used when I started making mac and cheese from scratch for the kids! Hope he stops by near you too. Happy Birthday! I love the snow on your blog. Then there’s the eggnog and bars to boot. P.S. I admire Alton Brown and his sense of humor. I am such an Alton Brown fan, too. I love that you elevated the egg nog recipe. I will try it with soy milk, for sure. Regular milk and I don’t get along so well – I am sure a lot of folks appreciate that you made it dairy-free. Of course, our chickens’ eggs are so fresh that they will be perfect for this. I appreciate your nod to Curls and Carrots with your DELECTABLE granola bars. Of course you take a recipe and make it a million times better. You definitely have a gift for baking and flavor combinations. Had lunch with my parents today and had wrapped three granola bars for my dad. By the time we left the restaurant, he’d finished all three! (He’s a tiny man, too, so have no idea where his food goes.) You’ve got yourself a good recipe. Hey, we’re up to 20F today, so it’s like the tropics 😀 Hope you’re warm, too. Yes, I definitely have much respect and admiration for AB. He is pretty amazing. And so fun! I believe his homebase is Atlanta, my husband’s hometown! Your lunch with your parents looked delicious. I was totally food stalking your facebook page! Oddly, I had four granola bars before my lunch. One of those days. I think it is the chocolate that I can’t resist. 20 degrees! It is almost like the tropics for Minnesota! hehe. Stay warm. Au contraire, Liz. I respect egg nog IMMENSELY. I love the stuff, but I think I’ve only had it out of a carton. I would love to try it homemade if I could get over the raw egg thing. I love Alton Brown too, so really I should just do whatever he tells me. I’m not a fan of snow ever–not when in falls in October (it happens) and not when it’s still on the ground in April. But the blog flakes are harmless. I love eggnog, whether using the raw egg or the custard it’s delicious. Your recipe is simple and looks so delicious. I can’t wait to make some. I have to cook because there are young children and have to make two versions with and without alcohol. I like to use rum and cognac or brandy but the rum in my opinion along with the nutmeg are what makes egg nog have that distinctive flavor. The granola bars look great too!! Suzanne, I SO appreciate your comment. Loving all the love eggnog is getting here 🙂 Am glad I tried homemade–obviously the better choice, no matter cooked/uncooked, what type of booze (if any), etc. Agree that using rum was tops. Yum, that eggnog looks delicious! If I hadn’t already completely overdone it on sweets this week (well ahead of Christmas!) I’d be making a cup right now. I admire you for making a mug for one. 😉 Happy holidays Liz! Thanks 🙂 I knew I’d be the only one drinking it and figured it didn’t have much of a shelf life, so one serving seemed smart. Will be easy enough to make another! Hope you’re enjoying your sweet treats. Yes, definitely, ’tis the season. Happy holidays to you, too. Your eggnog looks so good! I love the mug, hoping to get one when I’m in Vermont! I had eggnog once as a kid after bugging my mother about trying it- I didn’t like it, hated the taste of rum and once I found out raw egg was in it eggnog was over for me, I’ve never tried it since that time! But you have me thinking I should try it again especially as it looks so good! Heading over to see the granola recipes now! Thanks, Jayne 🙂 Funnily enough, the mug was once a jelly jar. Makes a perfect drinking glass, though, so we kept it for that once the jelly was gone. Glad to have you over. If you’re not a fan of rum, then this drink isn’t for you. Though you could have it sans booze or use a different spirit. Use AB’s cooked recipe and you’re set! Good to know this was easy to make AND so good. I’ve never made my own eggnog before, but I do love good eggnog. That’s an awesome cartoon on BFN! We had a zabaglione the other night, a proper old fashioned one, in an Italian restaurant that is definitely old fashioned and not (fashionably) retro. It was amazingly cloud like, and still potent, when preceded by limoncello. Which makes me think we will enjoy retro eggnog too. With rum, sherry and whiskey, please. Thanks, Saucy 🙂 Your dessert sounds perfectly amazing. Swooning here. Rum, sherry, and whiskey–wow. That would put me into a swoon too. Appreciate you coming by BFN as well! Sorry I missed your birthday, Liz! Happy late birthday! That makes us the same star sign. If I every do make eggnog, it will be because of you. That was pretty sneaky taking all Amb’s snow. I think you should do the right thing and take it back. Thanks for the birthday greetings, diddy. I take them anytime–early, late, whenever. You too are a Sagittarius? Have no idea what that means, really. Are you into astrology? I suspect you will not be making eggnog, but if you like it, but can’t get it where you are, then you must make it to have it. Got it? It’s easy–trust me. There is plenty of snow to go around for those in Minnesota, Canada, and the like. I most certainly did not take amb’s snow and am shocked you would suspect that of me. That eggnog looks amazing!! And I’m not a huge fan of eggnog—a couple sips and I’m good. But add rum? Yes please! And those granola bars look awesome. I need to try them asap! I’ll let you know how they turn out when I try them! 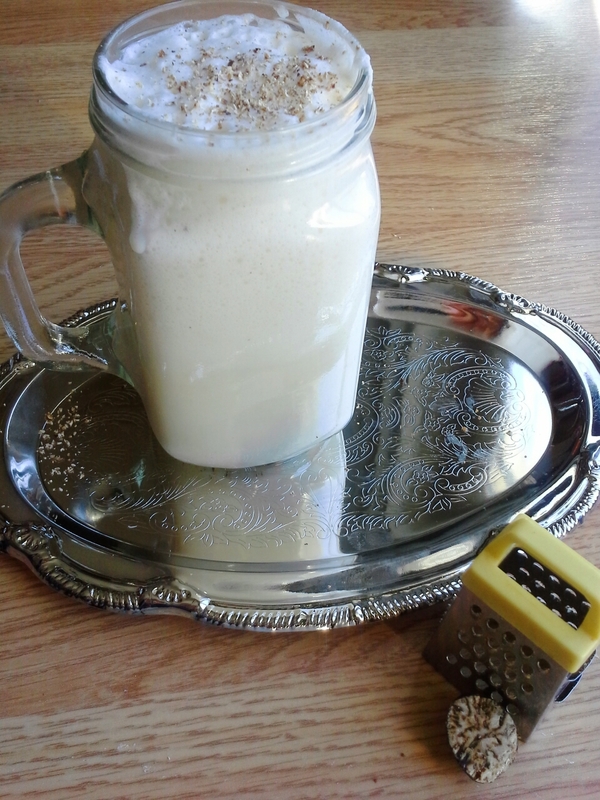 I would love this Clark Griswold inspired eggnog drink! it is a must to have one of these concoctions around large, family get togethers I think! lol. I’m happy to see you have these granola bars…it’s refreshing to see something not overly sweet, which is kind of rampant this time of year!